Cristiana Morganti hails Pina Bausch in an exhilarating show at Timbre 4, while an all-male, all-Sardinian version of Macbeth brings ghostly visions to life in BA. This past week, Italian productions really made a mark in the international programme of the 12th edition of Festival Internacional de Buenos Aires (FIBA). The Buenos Aires City Culture Ministry, together with ITALIA XXI (produced by Teatro Coliseo and Istituto Italiano di Cultura), brought two very different yet exceptional shows, that were particularly appreciated by local audiences. Last weekend at the Timbre 4 theatre, it was the turn of Moving with Pina: A Lecture Performance on the Poetry, Technique and Creativity of Pina Bausch, a work by Cristiana Morganti, the long-standing Italian soloist of the Tanztheater Wuppertal, the legendary Bausch theatre-dance company created in Germany in 1973. 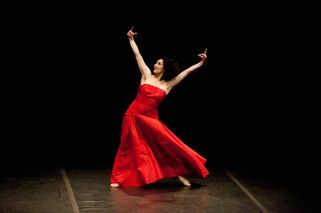 In a “danced conference” Morganti invited the audience on a journey through the universe of the legendary choreographer Pina Bausch. She began her presentation in a shiny and silky red dress in bare feet, showing off a first potent choreographic phrase that obviously belongs to Bausch. From the very beginning, she introduced the viewer into the poetry of the German icon, with an emphasis on movements loaded with emotion and truth, delicate elegance – and eye-catching dresses. Morganti proposes an original format; it is not so frequent that one gets to enjoy a lecture together with a performance. Usually, this kind of speech is exclusively theoretical or detached from the show. Yet in this case, the speech and the dance are so intertwined that this combination becomes a singular creation, almost a genre in of itself. Besides her background working with Bausch (what a luxury to be near such a talented dancer), Morganti is charming and histrionic, as well as very funny, in line with the sociable, relaxed style of the Italian tradition. Morganti makes this performatic lecture a truly enjoyable experience; she is an excellent storyteller and for moments she becomes a wonderful pedagogue – even if you’ve never seen Pina Bausch’s pieces. Moving with Pina is a true homage from the Italian dancer. Not only does she describe Bausch – whose work created a before-and-after in contemporary performing arts – with tenderness, admiration, humour and poetry, but she gives as well a very detailed explanation about her creative processes, especially with regards to The Rite of Spring (in which Morganti danced for 20 years). She enlightens the audience about how she achieved different choreographic phrases, following Bausch’s questions, suggestions and indications. Throughout her performance, Morganti invokes Bausch’s own presence on a BA stage delighting the viewers, who were certainly moved. The other Italian work to draw the eye, premiered last Wednesday at the Teatro Coliseo, was Macbettu, a version of Shakespeare’s Macbeth performed in Sardinian – and in the purest Elizabethan tradition – by an all-male cast. 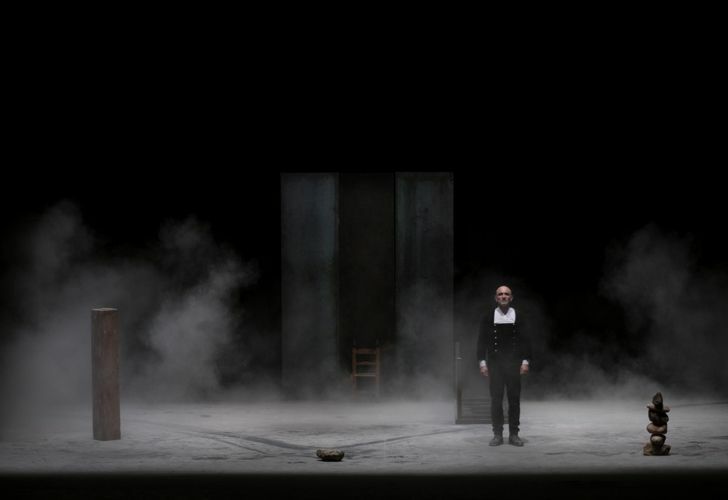 Alessandro Serra, the founder of the Teatropersona company, rewrote and directed the play, as well as (from a comprehensive perspective of theatre creation, maybe in the line of symbolist theatre) taking on responsbility for the costumes, set, lighting and sound design. Serra focuses on the most important episodes and characters, creating a dynamic staging of Macbeth, which has been very lucidly condensed to a running length of 90 minutes. According to Polish theoretician Jan Kott, Shakespeare’s piece paints history as a nightmare, that “paralyses and terrifies ... in Macbeth history, as well as crime, is shown through personal experience.” This atmosphere of personal nightmare is present in every audio-visual aspect of Serra’s production. The evanescent and ghostly presence of dust flying and spreading all over the stage, the suggestive use of the sound to distort voices or to potentiate material, the phantasmagoric light design; all of them reinforce the nightmare happening in Macbeth’s mind. Kott also observes that whereas in other Shakespearean tragedies death sentences are executed off-stage, “in Macbeth, death, crime, murder are concrete.” This tangibility is evident in Serra’s work because of the very rotund, millenary and basic materials used for set design, which are coincidentally items relevant in Sardinia geography, history and architecture: metal and rock (the latter especially becomes so, in this version a symbol of death). Each element of the set is polysemous and rich in metaphor, such as the balancing door during the famous dialogue about the effects of drinking alcohol. The costume design is ascetic enough so as to suggest how timeless the topics dealt with in Shakespeare’s pieces are, but yet also to illustrate how eternal is the struggle for power in general. Moreover, the fact of being spoken in Sardinian – a minority language considered one of the closest genealogical descendants, if not the closest, to Latin by many linguists – generates an atavistic feeling. Likewise, the performances have grotesque and rough features that produce a very earthly and ancient atmosphere. In Macbettu, the emblematic witches of the original remind one of those old women of Sardinia, dressed in black. Yet they are performed (with a dose of humour) by men, as is Lady Macbeth, who is performed by an actor much taller than the man who plays her husband. And speaking of archaic references, while this is a detail that can be traced back to the origins of Elizabethan theatre (when the participation of women onstage was forbidden), it also has dramatic resonance, because these characters have indeed masculine aspects. Macbeth refers to the witches’ beards and Lady Macbeth is constantly questioning her husband’s manhood and treating him as a coward, switching roles in some way. Besides, this production was inspired by Carnival celebrations in Sardinia, where the parades were exclusively performed by men.